Affiliate marketing is the easiest earned commissions in the world. The process involves promoting other internet vendor's products to earn commissions as large as 50 - 75 of the purchase price. What would you do with daily income such as this flowing into your account on autopilot while you sleep, play or work? Could you quit the job that you hate spending all those hours? Would you take the long dream vacation that you have always wanted to take with no stress knowing that the money would keep coming into your account while you were off enjoying yourself? Creating a Product Review Wesite from scratch in not easy and paying professionals to do it for you can get very expensive. 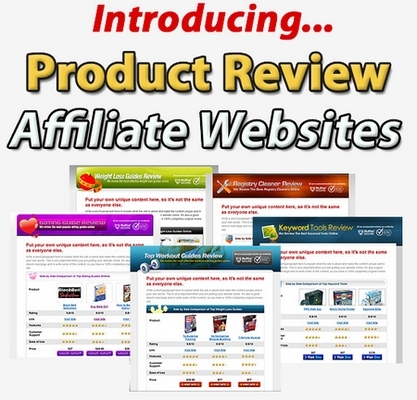 * Top 3 Clickbank Affiliate Products. Clickbank marketplace has been researched for the best products, We've done the hard parts for you. * Compelling Copywriting & Professionally Written Product Reviews. No need for you to write anything. Powerful attention grabbing headlines and catchy copy will hook your prospects and force them to buy. We've hired expert writers to do it for you. * High Quality Graphics. Makes you look professional so people will trust you and feel better about buying from you.